The arrangement of tissues in stems and roots is similar, although there are differences between monocots and dicots, as well as between seed plants and non-seed plants. These will be discussed later under section "Stele Types." In gymnosperm and dicot stems, the center of the axis is occupied by parenchymatous pith tissue, which functions as a storage tissue and sometimes a water source. Surrounding the pith is a ring of vascular bundles, each containing xylem and phloem. The most common type of bundle is collateral, with xylem toward the pith and phloem immediately outside the xylem. Outside of the vascular tissue is the cortex, with the epidermis external to it. Both the pith and cortex are primarily parenchymatous, although sclereids, fibers, secretory cells or canals, and other specialized cells may occur in either tissue. In the stems of monocotyledons, the vascular bundles are not arranged in a ring but are scattered through the stem. In this case, it is impossible to distinguish pith and cortex, so the tissue in which the bundles are embedded is simply called ground tissue. The vascular tissue in stems and roots, together with associated parenchyma, including the pith if present, is termed the stele. 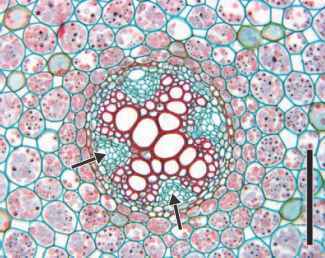 In the roots of most plants, there is no pith, and the xylem occupies the center of the axis; monocot roots have a central pith with vascular tissue in a ring. The xylem is ribbed and the phloem occupies the area between the ribs. In cross section, these ribs resemble two, three, or four arms extending from the center of the root (FIG. 7.21 ) . A fundamental difference between stem and root anatomy is the position of the phloem with respect to the xylem. In stems, the phloem is immediately outside the xylem, but in roots, its position alternates with that of the xylem, so that phloem and xylem are situated on different radii in a root, but the same radius in a stem. This concept is important in classifying fossil axes as roots or stems when there are no laterals attached. figure 7.21 Cross section of Ranunculus sp. root showing tetrarch xylem strand with phloem between arms (arrows). Note starch grains (stained pink) in cortical cells (Extant). Bar = 200 pm. figure 7.22 Longitudinal section of Lupinus sp. root showing origin of lateral root from pericycle (P) (Extant). Bar = 500 pm. 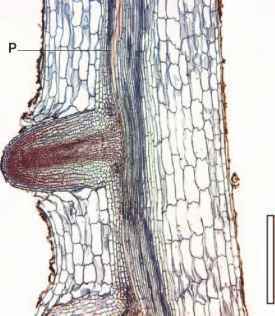 figure 7.23 Cross section of branch root arising from pericycle of Salix sp. root (Extant). Bar = 250pm. root. As noted earlier, the laterals produced by stems, that is, leaves and axillary buds, are produced by the apical meristem early in primary growth, but this is not the case in roots. Because leaves arise from the outer tissues of the stem, they are said to have an exogenous origin. Since lateral roots arise deep in the root tissue in the pericycle, they have an endogenous origin. In addition to stelar differences, the origin of laterals is another fundamental difference between roots and stems and is often an important anatomical character used to identify isolated axes found in the fossil record. Immediately outside the pericycle is the endodermis (FIG. 7.24), a single layer of cells lacking intercellular spaces that can be recognized by characteristic thickenings, Casparian strips, in its transverse and radial walls. The endodermis represents the innermost layer of the cortex and functions as a physiological barrier that regulates movement of solutes into and out of the vascular tissue in the stele. 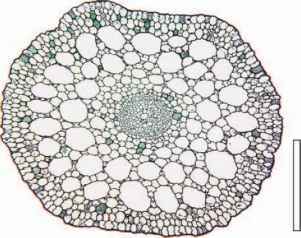 Casparian strips surround the sides, top, and bottom of each cell, but do not cover the inner and outer tangential walls; they are rich in suberin, making them hydrophobic. These strips effectively seal off the tiny canals and spaces within the walls, or apoplast, of the endodermis, and thus force diffusion of solutes through the plasma membrane and cell lumen of the endodermal cells, that is, materials must move through the symplast or the living parts of the cells, thus providing some physiological control over lateral movement into and out of the stele. 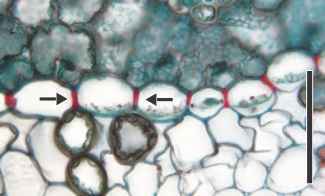 figure 7.24 Transverse section of Pinus leaf showing endoder-mis and thickened casparian strips (arrows) (Extant). Bar 75 = ^m. figun 7.25 Cross section of Elodea sp. stem showing aeren-chymatous cortex (Extant). Bar = 650 pm. large intercellular spaces (FIG. 7.25). The cortex is principally a storage tissue, although some of the outer cells in young stems may be photosynthetic. The periphery of the cortex may contain collenchyma in young axes, but scleren-chyma is more common in older stems and roots; epidermis covers the outside of the plant. If a plant does not have secondary growth, then maturation of the primary tissues completes growth. See section "Secondary Development." 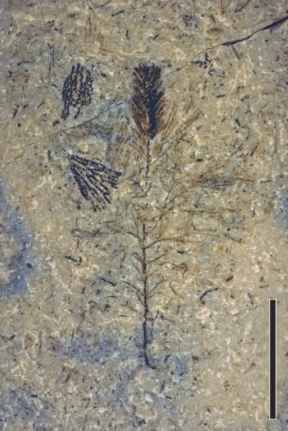 Which group of tissues form the stele in monocot rocks? 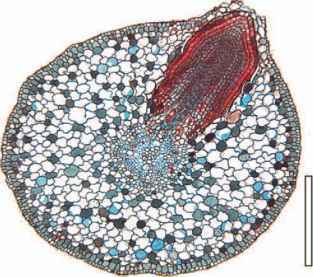 How does the arrangment of the tissues in root differ in monocot and dicot?